ASEAN is India's 4th largest trading partner, accounting for 10.2 per cent of India's total trade. India is ASEAN's 7th largest trading partner. Trade is back on track and registered an 8 per cent increase in 201617, as compared to the previous year. 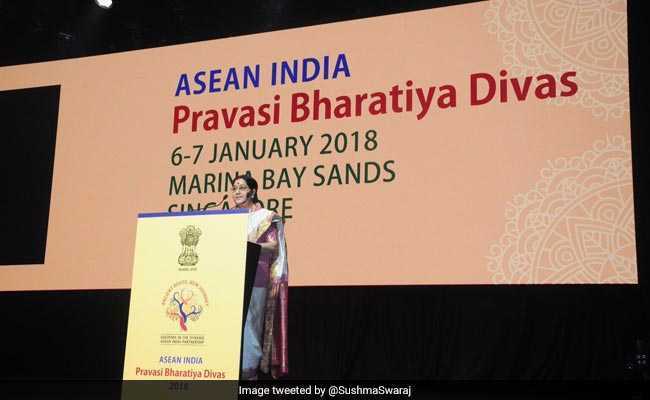 Sushma Swaraj addresses Indian diaspora at the ASEAN India Pravasi Bharatiya Divas. Singapore: India's dialogue partnership with ASEAN has evolved into a strategic partnership and the Indian diaspora provides a platform for stronger ties with the grouping, External Affairs Minister Sushma Swaraj said today. Addressing the Indian diaspora at the ASEAN-India Pravasi Bharatiya Divas in Singapore, Ms Swaraj reaffirmed India's commitment to ASEAN. "We are here to reaffirm our commitment and to share the course of our journey ahead to the future of India and ASEAN in the world," Ms Swaraj told some 3,000 delegates. "Our diaspora provides a platform for a stronger relationship between India and ASEAN countries," she said. Noting the 25-year milestone of ASEAN-India partnership, she said, "Our dialogue partnership has evolved into a strategic partnership." "India's engagement with the ASEAN region lies in the clarity of the principles that we share. We believe that when all nations adhere to international rules and norms and when we conduct on the basis of sovereign equality and mutual respect, our nations feel secure and our economies prosper," Ms Swaraj said. "As India's economy grows its ties will deepen, its trade and investment flow will grow," she said, emphasising that ASEAN was a part of India's Act East Policy. She said states play a vital role in India's progress and advancing the country's economic ties with the world. She highlighted the presence of Assam chief minister Sarbananda Sonowal at the gathering and underlined that the North East will grow and become a bridge to South East Asia. "Our North East region will prosper when it is better connected to South East Asia and when the North East becomes our bridge to South East Asia, we will be closer to realising our hopes for India and ASEAN ties," she said. She called for addressing the common challenges in the region like creating skills for the digital age, generating jobs in the age of disruption, meeting the need of rapid urbanisation, protecting the bio-diversity and making the energy sources cleaner. "We are moving from industrial age to information age. The global power balance is shifting, and the relation between nations are changing," said Ms Swaraj. "There is interesting new technology but unsettled question of history still divides us. At the same time, we see progress and opportunities as never before," said the minister. "It is the time for India and South East Asia to work for prosperity for its people and secure a peaceful future for new generation," she stressed. ASEAN is India's 4th largest trading partner, accounting for 10.2 per cent of India's total trade. India is ASEAN's 7th largest trading partner. Trade is back on track and registered an 8 per cent increase in 201617, as compared to the previous year. New Delhi will host a commemorative summit on January 25 to mark the 25th anniversary of the Dialogue Partnership between India and the ASEAN in which all the leaders of the grouping are expected to participate.